"The human brain has amazed and baffled people throughout the ages. Some scientists and researchers have devoted their entire lives to learning how the brain works. Here are some facts about your brain." "It’s not genes that carry us into a healthy old age—or not genes alone. Lifestyle factors are very, very influential in determining who survives and who does not—as well as in determining who can think clearly decade after decade and who succumbs to the tragedy of dementia." 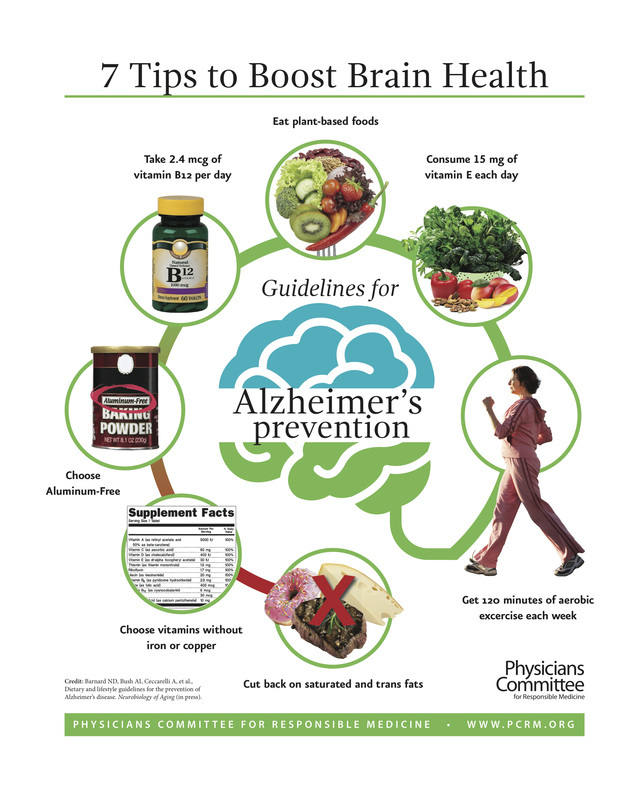 "Lifestyle changes could potentially prevent hundreds of thousands of cases of Alzheimer’s disease every year in the United States." "Lack of adequate blood flow to the brain due to clogging of cerebral arteries may play a pivotal role in the development and progression of Alzheimer’s dementia." "High-tech advances, such as PET scanning, offer new insight into the role cholesterol plays in both the amyloid cascade and vascular models of the development of Alzheimer’s dementia." "Ever have trouble remembering where you left your keys? Not sure what you ate for breakfast yesterday? A vegan diet might be the answer to your woes! A new study out of the Rush University Medical Center indicates that eating more green vegetables like spinach, kale, and broccoli can boost your memory and even keep brain diseases like dementia and Alzheimer’s at bay." The Diet, Alzheimer’s and Diabetes Connection? "You probably already know that poor diet can lead to Type 2 diabetes (See also Diabetes), but there is growing discussion of the connection between diet and Alzheimer’s disease." "Researchers at the University of Cincinnati Academic Health Center think that the blueberry could be the ultimate brain food. It's already considered a "super fruit" for its power to potentially lower the risk of heart disease and cancer, but, according to their new research, it could also be used as a weapon to fight Alzheimer's disease." "Just in case you need another reason to cut back on junk food, it now turns out that Alzheimer’s could well be a form of diet-induced diabetes. That’s the bad news. The good news is that laying off soda, doughnuts, processed meats and fries could allow you to keep your mind intact until your body fails you." "In many respects, Alzheimer’s is a brain form of diabetes. Even in the earliest stages of disease, the brain’s ability to metabolize sugar is reduced. Normally, insulin plays a big role in helping the brain take up sugar from the blood. But, in Alzheimer’s, insulin is not very effective in the brain. Consequently, the brain cells practically starve to death." Click Here for the article by Dr. Suzanne DeLaMonte Alpert Medical School, Brown University Neuropathologist, Rhode Island Hospital. "A recent review found a growing body of literature showing decreased risk of cognitive impairment and Alzheimer’s dementia with greater adherence to plant-based diets." "Nutrient biomarker patterns, cognitive function, and MRI measures of brain aging," published in the Dec. 28 issue of Neurology, found some striking patterns relating what people eat to how their brains function... people with high plasma levels of B vitamins and vitamins D, E and C had more total brain volume and better overall cognitive functioning. Additionally, people with higher levels of Omega-3 fatty acids running through their bloodstreams were found to have better executive function... the study indicated that eating foods high in trans fats -- mostly junk food, like processed pastries and fatty red meats –- may cause brain damage"
"High intake of unsaturated, unhydrogenated fats may be protective against Alzheimer disease, whereas intake of saturated or trans-unsaturated (hydrogenated) fats may increase risk." "A healthy diet is about more than keeping yourself fit and free of heart disease, wrinkles and impotence (yes, all are related to food!). It's about preserving your memory, too." "There’s an absolute link between diet, heart disease, stroke and cognitive decline. Your vascular system is like a tree. There is one main network. If you clog your arteries via diet it affects your entire body.... Just like heart disease and stroke, vascular dementia is caused by plaque buildup in the arteries." "Different fruits and vegetables appear to support different cognitive domains of the brain, so both variety and quantity are important." "Now, researchers at the University of Rochester Medical Center (URMC) Center for Translational Neuromedicine believe they may have discovered yet another clue as to why sleep is mandatory for good health—especially brain health"
"Most public health agencies and nutritionists in the United States still recommend no- or low-calorie artificial sweeteners as an acceptable, and even preferred, alternative to sugar. This flawed advice can have very serious repercussions for those who follow it." "We tend to think that a loss of mental acuity is just part of getting older — but age is not the only contributing factor to cognitive decline. Our lifestyle also plays a key role. Poor diet, a lack of sleep and exercise, ongoing stress, smoking and environmental pollutants all damage fragile brain cells. Fortunately, mental deterioration is not irreversible. In fact, the brain is incredibly dynamic and has the potential and the ability to change at any point throughout our entire life. And, you have the power to enhance your brain function, protect your brain from damage and counteract the effects of aging! It all comes down to your everyday decisions." "Not all types of meditation are created equally. Some alter our brainwave states so that we become more calm and centered, helping us sleep better at night or dampen the ‘monkey-mind’ which many traditions speak of, the tendency for our minds to wander from thought to thought incessantly. Others boost brain performance, or reduce stress." "The brain can be trained to prefer healthy food over unhealthy high-calorie foods, using a diet which does not leave people hungry, suggests a study from the US." The Association Between Habitual Diet Quality and the Common Mental Disorders in Community-Dwelling Adults: the Hordaland Health Study. "In this study, those with better quality diets were less likely to be depressed, whereas a higher intake of processed and unhealthy foods was associated with increased anxiety." "We systematically reviewed 12 epidemiological studies to determine whether an association exists between diet quality and patterns and mental health in children and adolescents; 9 explored the relationship using diet as the exposure, and 3 used mental health as the exposure. We found evidence of a significant, cross-sectional relationship between unhealthy dietary patterns and poorer mental health in children and adolescents. We observed a consistent trend for the relationship between good-quality diet and better mental health and some evidence for the reverse." "Despite the popularity of music-based interventions in dementia care, there is a limited knowledge of how and why people with dementia find music beneficial for their well-being. A qualitative study was conducted to develop further insights into the musical experiences of people with dementia and explore the meaning of music in their lives."